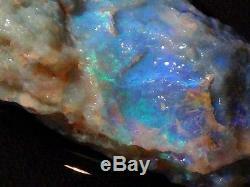 LIGHTNING RIDGE GEM SOLID OPAL OCEAN BLUE/GREEN NOBBY ROUGH 137 ct (+vid). Item specifics Condition: New with tags: A brand-new, unused, and unworn item in the original packaging (such as the original box or bag) Natural/Lab-Created: Natural Colour: Blue/Green Shape: Rough nobby Total Carat Weight (TCW): 137 ct L. H mm: L 59 W 35 H 16-21 Country of Origin: Australia. Lightning Ridge is a flourishing tourist town with numerous caravan parks. There iswell-appointed bowling club with its eight artificial-grass bowling greens. There is a well-appointed bowling club with its eight artificial-grass bowling greens. Temperatures in summer can reach into the high 40s Celsius, but below ground the temperature remains continually at around 22 degrees, year round. The Lightning Ridge area is a world-renowned centre of the mining of black opals and other opal gemstones. Lightning Ridge has the largest known deposits of black opals in the world. The name Lightning Ridge is said to have originated when in the 1870s some passers by found the bodies of a farmer, his dog and 200 sheep which had been struck by lightning. Absolute Opals is a second generation mining enterprise, Here are some pictures of our mining activity. We prospect for opal with a 9 auger drill. When good material is discovered we drill a shaft down to reach the opal level. When payable material is found, we put a mechanical digger down the hole. The dirt is removed by a blower kind of like a giant vacuum cleaner. When the truck is full, it goes to the Agitator, a modified cement mixer where it is washed during the week. Up to 10 truckloads of dirt go into each batch of wash, which accumulates and wears down to concentrate by the end of the week. Then, we just pick out the gems, often none, but once every few years you drop onto a pocket. Then it is off to the cutting room. Many people come to Lightning Ridge for weeks at a time on holiday to fossick through the dumped material where valuable opals are sometimes missed by the miners. Fossicking for overlooked opal on abandoned mining claims is a popular activity. If you are lucky, and work hard at it, there is every chance you will find valuable opal. Lightning Ridge is an important paleontological site, with fossils dating back to the Cretaceous period, 110 million years ago. The sandstone rock once formed the bottom of a shallow inland sea where the remains of aquatic plants and animals were preserved. The site is especially important as a source of fossils of ancient mammals which, at that time, were small creatures living in a world dominated by dinosaurs. The fossils are sometimes opalised and discovered by opal miners. Important discoveries at Lightning Ridge include the ancestral monotremes Kollikodon ritchiei and Steropodon galmani. Plentiful crops of wheat are grown in the dry lakes surrounding the opal bearing ridges. After a long day, you can relax in the artesian thermal pool- it is free! We hope we can welcome you to our unique town one day! We can meet you at the Tucson Gem show, Days Inn Gem Pavilion Absolute Opals Booth #3 and 4 every year as well. We pride ourselves by trying our best within eBays policies to provide an excellent product and service to all our customers. We take extra care with our packing to help insure the safe arrival of your items. ECheques take a minimum of 5 days to clear. The amount of time spent in transit within the postal system is outside of our control. We have eBays automatic unpaid item assistant on all items. Please check in the item specifics section for the actual dimensions of all listed items. It is difficult to achieve total accuracy in representing opal with digital photography for the following reasons. The human eye sees things slightly differently to the digital camera because of the different mechanisms of how they register light. Each persons eyes see a little differently to the next persons eyes. Many computer screens are manufactured and calibrated a little differently to each other. Example; a LED screen will have alot more contrast than a Laptop Screen. The opal colours and patterns seen are a result of a complex combination of refraction, diffraction, diffusion and reflection of light from the opal structure. When an opal is viewed with different light sources and different light intensities the effect of the stone can change a little from one light source to the other. The total combination of these facts means there will be some degree of inaccuracy when representing opal with digital photography. To compensate for these factors I like to list items with still photos and a movie with all care and techniques taken to represent the stone as accurately as possible. ARE OFFERED FREE WITH AUSTRALIA POST AS INTERNATIONAL OR DOMESTIC STANDARD POST. THESE AT COST PRICES ARE CALCULATED AT AVERAGE COST WITH INFORMATION DIRECTLY FROM AUSTRALIA POST. TO OFFER THE BEST AND FAIREST PRICE, WE CHARGE THE AVERAGE, SOMETIMES WINNING A LITTLE AND SOMETIMES LOSING A LITTLE. Welcome, We at Absolute Opals & Gems Australia are second generation, Gem Stone Miners / Cutters / Wholesalers, proudly specializing in Australian Black Opal, directly from the mines. You will find us located in the heart of the busy mining town of Lightning Ridge New South Wales , approx. 700 kms or 320 miles, north west of Sydney , Australia. Lightning Ridge, or the Ridge, as it is fondly known by locals, is world famous for the largest production of Black Opal in the World! The Ridge has played host to many a miner over the past 100 years coming to try their luck. Some have struck it rich, while others continue to try. IF YOU DO VISIT THE RIDGE BE SURE TO VIEW OUR DISPLAY ROOM AT 66 MORILLA ST. The item "LIGHTNING RIDGE GEM SOLID OPAL OCEAN BLUE/GREEN NOBBY ROUGH 137 ct (+vid)" is in sale since Thursday, October 20, 2016. This item is in the category "Jewellery & Watches\Loose Diamonds & Gemstones\Loose Gemstones\Opal\Other Opals". The seller is "absolutely-love-opals" and is located in Lightning Ridge. This item can be shipped worldwide.